View more webinars from Austin Kleon. Back in March, my friends Mike Rohde, Sunni Brown, Dave Gray and I presented a panel to a packed house at the SXSW Interactive conference here in Austin, Texas. Last week, they posted a podcast of the session without visuals – so I spent some time syncing our slides to the audio. Watch it above, or see the whole thing here: Visual Note-Taking 101 from SXSW 2010. The coolest artifacts from the panel are the amazing Scout Books that Pinball Publishing had printed for us: read all about them. I can’t think of a nicer way to cap a release day than with a successful release party in your home town bookstore, so thanks a million to BookPeople, to my wife Meg for baking her delicious chocolate chip cookies, and to the 50+ folks who came out on Tuesday night! Y’all are the best. See a bunch of photos from the event on Flickr. I was really stunned by how focused everybody was, and by how many people offered to stand up and read their blackout poems for the group. It was truly awesome. You can read some of the poems over on the Newspaper Blackout Tumblr. Again: thank you thank you thank you to everyone who came out! It was such a gas to see y’all with markers and newspapers in hand. For those of you outside of Austin, we don’t have many national dates planned yet, but I’m hoping that will change, so stay tuned. Austin Kleon has gained a fan not merely because of his down-to-earth and quietly erudite personality, but because the poems he has “found” buried within newsprint are poetical gems in their own right. Austin Kleon at PechaKucha Night Austin 07 from PechaKucha Night Austin on Vimeo. Above is the video for my Newspaper Blackout Pecha Kucha presentation last month in Austin. PechaKucha Night was devised in Tokyo in February 2003 as an event for young designers to meet, network, and show their work in public. It has turned into a massive celebration, with events happening in hundreds of cities around the world, inspiring creatives worldwide. Drawing its name from the Japanese term for the sound of “chit chat”, it rests on a presentation format that is based on a simple idea: 20 images x 20 seconds. It’s a format that makes presentations concise, and keeps things moving at a rapid pace. It was incredibly difficult to time and plan out, and it’s probably the best presentation of my work that I’ve come up with. The audience was really amazing. Thanks to everyone who came, and thanks to Carla and Herman for inviting me. Here are all my slides in one deck. At last week’s VizThink Austin (@VizThinkAustin on Twitter) my friend Sunni Brown asked me to give a variation of my Visual Thinking for Writers talk. Little did I know that Chris Haro of Mighty Pretty Media was going to be there taping, and he was kind enough to allow me to post it all online. I can’t imagine how much time it took him to edit 40 minutes worth of video, so thank you, Chris! In the first three videos, I talk way too much about my writing background, then get on to good stuff, like how to use index cards to brainstorm ideas, using graphs to understand story structure, and the power of adding captions to pictures. Y’all rock. I hope that those of you in the Austin area will come to the next Vizthink. You can watch the videos below or in this Youtube playlist. It was a catalogue of techniques I’ve discovered over the past couple of years that have helped me with my own writing. In my experience, it’s not a silly question at all: tools -> process -> writing. The way you work is important. My main idea was that the best thing you can do for your writing is step away from the computer, spend $10 in the school supply aisle of your local grocery store, and start making writing with your hands. (See this Wall Street Journal article that asked novelists how they write — well over half of them start with handwritten notes, index cards, etc.) If I was going to teach the workshop in the flesh, I would simply organize it by pens, index cards, post-it notes, scissors, tape, etc. I’ve posted some of my slides below. The challenge, as always, was to get the students circling concrete nouns and verbs — words that put images in the head. We only had a half hour or so, so we didn’t get any finished poems, but I promised everybody I’d go home and see what I could get out of the work we started. I’ll post the results here when I get a chance. Thanks to Laurence, Angelo State, and all the great students! I’m hoping we can do more of these workshops after the book comes out. It was a rad way to spend 3 hours: I taught the first section called “But I Can’t Draw!” that tried to get people thinking about drawing as building or collage using a simple alphabet (line, point, circle, square, triangle). We learned to draw stick figures and faces…oh, it was good fun. AND I found out that I really, really love teaching: what could be better than sharing your passion with eager students? Mike has a good recap that pretty much covers everything that went down, including notes from my section and notes from the awesome participants, and Sunni has posted her tips on listening for graphic recording and visual note-taking. I also highly recommend checking out the notes tagged viznotes on Flickr and all the great Twitter chatter about the event. 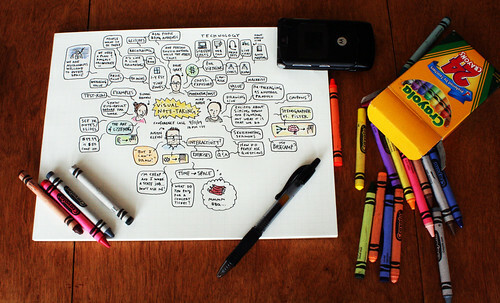 And be sure to check out VizThink! On May 12th, I’ll be doing a Vizthink webinar with my friends Sunni Brown, Mike Rohde, and Dave Gray (as moderator) on visual note-taking. Price is $99, but you get access to the live session AND the recording AND it all goes to the good cause of keeping the Vizthink staff and community afloat financially. Sunni does graphic facilitation for a living, so she’s used to talking about her and her work, but this will be the first time that Mike or I have dug in and tried to explain what it is that we do. The seminar will be in three parts. Sunni will talk about the art of listening and Mike will talk about being an editor vs. a stenographer. My part is called, “But I can’t draw!” I’ll be addressing folks’ fears of the pen, and talking about how there’s a a drawing alphabet just as there is a writing alphabet, and if you just learn the alphabet, you can draw anything. I’ll be using some cartoon theory, Lynda Barry’s “Two Questions”, Ed Emberley’s “Make A World”, and ripping off Dave Gray’s stuff on how to draw. Please let me know in the comments if you have any specific questions you’d like to have answered or topics you’d like addressed! View more presentations from Austin Kleon. UPDATE: A recap of the event. Are you or do you know of a teacher or student who has used Newspaper Blackout Poems in the classroom? Are you a writer using them in your writing group or creative writing workshop? If so, please share your experience in the comments or e-mail me. I’m looking for lesson plans, results, testimonials, photos, videos, or even a few simple sentences about how you went about teaching them, what the response was, etc. UPDATE: Check out the comments for examples!